Last year astronomers made the first detection of gravitational waves from the merging of two black holes. 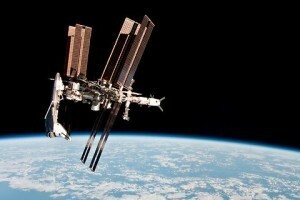 It gave us an entirely new way to view the cosmos. Now we aren’t limited by the emission and absorption of light by matter. We can explore the universe through ripples in the fabric of spacetime itself. Through recent observations we can study the most mysterious aspect of spacetime, known as dark energy. Dark energy is what causes the universe to expand. It makes up about 70% of the universe, but we don’t really know what it is. One reason for this is that we don’t know exactly how much it expands the universe. Cosmic expansion is typically defined in terms of the Hubble parameter H0. Because the universe expands, more distant galaxies appear to be moving away from us faster than closer galaxies. The velocity of a distant galaxy is related to its distance by v =H0d. We can measure the speed of a galaxy through the redshift of its light. The greater the galaxy’s speed, the more its light is shifted toward longer (red) wavelengths. Knowing the distance of a galaxy and its observed redshift, we can determine the Hubble parameter. When we do this for lots of galaxies, we get a value of about H0 = 67.6 (km/s)/Mpc. But there is a catch. We can’t measure the distances to the furthest galaxies directly. We use what’s known as the cosmic distance ladder, where we use one type of measurement to determine the distance of nearby stars, use that result with other observations to measure distances to close galaxies, and use that result to measure more distant galaxies. Each step in the ladder has its own advantages and disadvantages, and if one rung in the ladder is off, it throws off all the other ones. Fortunately, we have other ways to measure the Hubble parameter. One of these is through the cosmic microwave background. This remnant echo of the big bang has small fluctuations in temperature. The size of these fluctuations tells us the rate of cosmic expansion (among other things). Observations by the Planck satellite gave a Hubble parameter value of about H0 = 67.7 (km/s)/Mpc. But other methods of measuring the Hubble parameter give slightly different results. For example, one method looked at how light is gravitationally lensed by distant galaxies. Gravitational lensing can create multiple images of distant supernovae, and since each image takes a different path around the galaxy, they arrive at different times. The timing of these images can be used to determine the Hubble parameter, and the result is about H0 = 71.9 (km/s)/Mpc. A different method using distant supernovae gives a result as high as H0 = 73 (km/s)/Mpc. So what is the real value of the Hubble parameter? This is where gravitational waves come in. All of the measurements of the Hubble parameter so far rely upon observations of light. Gravitational waves provide us an entirely new method to measure cosmic distances. As two black holes or neutron stars begin to merge, they spiral ever closer to each other, creating gravitational waves we can detect. The frequency of these waves depends upon their masses, and their masses determine how much energy they produce when they merge. By comparing the energy they produce with the strength of the gravitational waves we observe, we know their distance. This is similar to the way standard candles are used in optical astronomy, where we know the actual brightness of a star or galaxy, and compare it to the observed brightness to determine distance. In fact, this new method has been termed a standard siren. 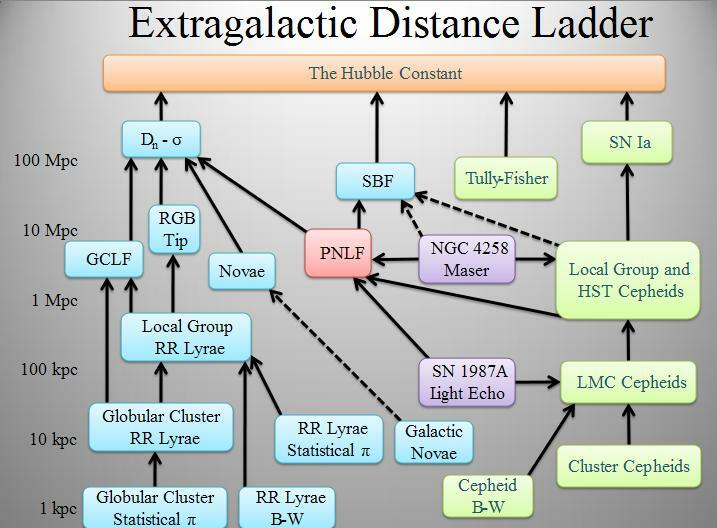 But distance isn’t enough to determine the Hubble parameter. We also need to determine its speed away from us. We aren’t able to measure the redshift of gravitational waves, so we can’t used them to measure speed. 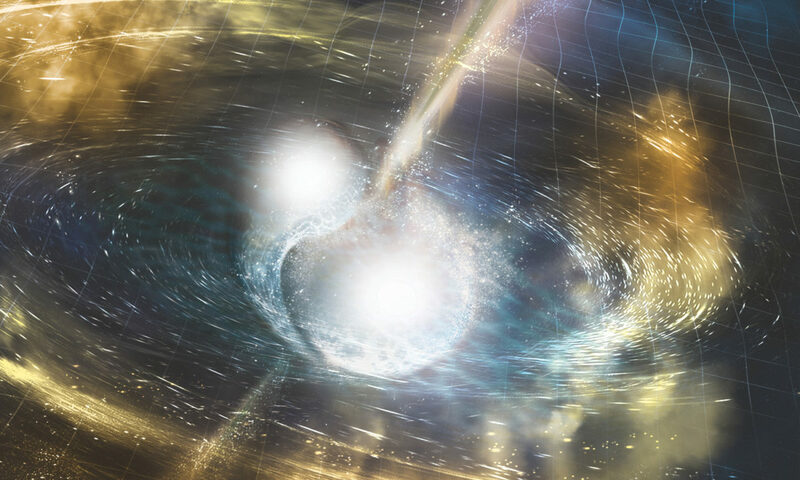 But when two neutron stars merge they produce both gravitational waves and light. For one such merger, we not only observed the light produced, but also its redshift. From that we can find the Hubble parameter. Since the distance is found directly from gravitational waves, it doesn’t rely upon the cosmic distance ladder or an assumed model of cosmic expansion. From this event it found H0 = 70 (km/s)/Mpc. While that result points to a larger Hubble parameter, the uncertainty of the result is really large. Based on the data, it could be as large as 82 or as small as 62. But this is only one measurement. As more mergers are observed, we will get more precise results. So gravitational waves will help us pin down the Hubble parameter. It’s only a mater of time, and space. Thanks for the blog post Dr. Koberlein. One minor point: in the first sentence, should the word ‘made’ be replaced for ‘announced’? Either are correct colloquial English, announced is a bit more formal or official. Ondas gravitacionais. Eu não acredito que existam ondas gravitacionais. Não sabemos ainda o que é gravidade. Como vamos saber o que é onda gravitacional? Para começar, este tecido espaço tempo deve ser uma metáfora. Outra coisa importante: O espaço é feito de um vácuo e vácuo não é matéria. Pode até conter algumas matérias, mas não tem pressão para comprimi-las. Não pode ondular. Este tecido espaço tempo proposto por Einstein é realmente uma metáfora como muitas outras colocadas por ele para justificar sua relatividade (A teoria da relatividade especial de Einstein é uma das idéias mais contraditórias na física). A teoria da gravidade é muito pior ainda. Como pode a massa de um corpo deformar o tecido espaço tempo. Isto é um absurdo. A matéria já nasce com massa e gravidade. Einstein já foi contra o big bang, Porque ficou a favor? Para apoiar sua relatividade cheia de erros. Quanto as ondas gravitacionais, é outra metáfora. O “LIGO” não aponta para lugar nenhum e explosões no cosmo existe aos montões. Pode muito bem coincidir uma explosão no espaço, com uma detecção no “LIGO”. Outra coisa. A velocidade da luz, não é igual a da gravidade. A luz viaja a 300.000 Km por segundo e pode levar bilhões de anos para chegar. A gravidade é instantânea. Dois corpos se atraem. Se A atrai B, podemos afirmar que B também atrai A. Não tem velocidade a ser computada. Esta gravidade e massa nasceram junto com a matéria. Não me conformo com tantos remendos na física cosmológica. Se tiver errado, por favor me ajudem.